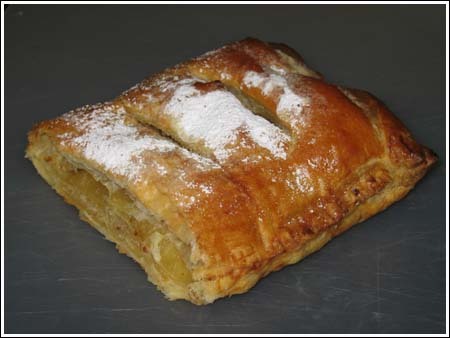 Easy Galette des Rois is made with Odense almond paste and packaged puff pastry. Even though it's made with convenience products, it tastes very authentic. Place the almond paste and half of the sugar in a food processor. Process until well blended. Add the butter and remaining sugar using and process until smooth, then blend in 1 egg, vanilla extract, almond extract, flour and salt. Empty mixture into a bowl and place in refrigerator for 2 hours or until slightly firm. Roll one sheet of the thawed puff pastry into an 11 inch square. Using a large pie plate or cake pan, trace an 11 inch circle onto the dough using the tip of a small knife. Place the circle of on a parchment lined cookie sheet. Repeat with second sheet of dough, placing the cut out circle on another sheet of parchment. Mound the almond filling onto the center of the pastry that is on the baking sheet. Leave about 1 1/2 inch margin at the edges. Press the bean or feve down into the filling. Place the second sheet of pastry on top, and press down the edges to seal. Beat the second egg with a fork, and lightly brush onto the top of the gallette. Use a knife to make a criss cross pattern in the egg wash, and then prick several small slits in the top to vent steam while baking. Bake for 15 minutes in the preheated oven. Do not open the oven until the time is up, as the pastry will not fully puff. Remove from the oven, and dust with confectioners' sugar. Return to the oven, and cook for an additional 12 to 15 minutes, or until the top is a deep golden brown. Transfer to a wire rack to cool.